Grand Tappattoo Resort is Located less than two hours north of Toronto, nestled among 50 acres of natural birch and pine trees, surrounded by the clear waters of Otter Lake. From our stunning and unique banquet and dining rooms to our lush outdoor grounds, we offer the perfect venue for anything from a grand affair to a quiet and intimate reception. We invite you to visit us for a personal tour to experience our beautiful and unique settings. Our all-season resort provides couples with a truly exceptional wedding experience. Whether you envision an outdoor wedding surrounded by a beautiful backdrop of foliage and blooms or the quiet beauty of a romantic indoor ceremony, our natural surroundings provide a superb setting no matter the season. Enjoy celebrating your remarkable wedding with an evening of exquisite dining and fine wines. 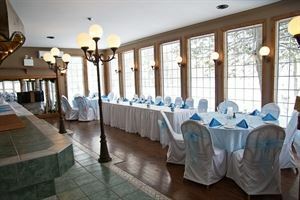 Wedding packages includes: • Complementary Stay on your wedding night in our Honeymoon Suite • Ceremony Set-up • Reception Hall with white on white linens • Three hors d'oeurves per person for cocktail hour • Three course plated meal or premier buffet option • Wine with dinners Please visit our website for complete package details.